Synagogue, 1897 by Delissa Joseph and 1936 by Cecil J Eprile. Minor later alterations. EXTERIOR: The principal façade is to the north. To the east is the Victorian section, of four bays with simple brick pilasters and pairs of windows: flat-arched to the raised basement, round headed on the ground floor, segmental headed above; the clerestory windows, set back from the elevation, are semi-circular. The colour of the bricks to the west of these four bays is slightly different, indicating where the work of 1936 begins; otherwise the final two bays of the prayer hall are identical to the Victorian section. The elevation terminates with the advancing, pedimented portico which has three round arched entrances on the ground floor, with prominent keystone painted white and metal grilles above the doors. Above this arcade is a simple plat band upon which rest two scrolls, referring to the Ten Commandments, and then a row of three square-headed windows with a continuous cill. The interwar portion reflects the rhythm and detailing of the Victorian elevation and the façade is coherent, if un-ambitious. The original railings survive. INTERIOR: Survives very well and is essentially work of 1897, seamlessly extended in 1936. The prayer hall has a gallery on three sides with two orders of cast-iron Corinthian and archaeologically-accurate Composite columns, timber balcony fronts and iron railings of 1936 and fixed bench seating. The unusual convex coffered Ark dates from 1897 and was originally accompanied at the east end by the bimah and pulpit, in the Reformed manner. This arrangement was altered in 1936 when a well-crafted, stylish Art Deco central bimah was introduced, with matching pulpit in front of the Ark. The dais and railings to the Ark also date from this period as is also likely for most of the seating. The stained glass in the prayer hall is all of a standard design, but each window has a different dedication commemorating members of the congregation including one to 'Sister Celia and relatives / liquidated by the Nazis 1939-1945'. The original lighting scheme survives. The lobby, which dates from the 1930s work, has a terrazzo floor and original doors to the prayer hall and staircase, each with a Star of David in its circular glass aperture. There are a number of memorials in the lobby and two foundation stones, including one to the original late Victorian building re-sited here in the 1930s. In the basement are classrooms, WCs and a hall, with stage and woodblock flooring. 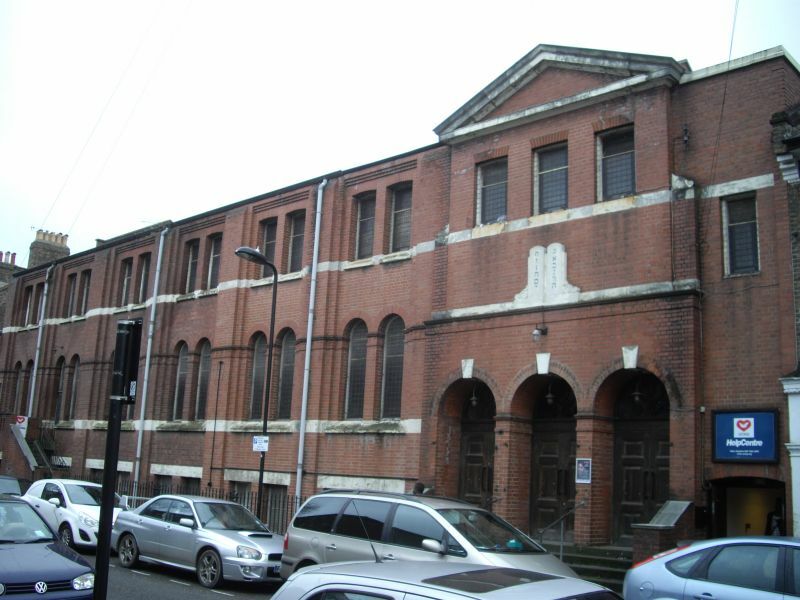 HISTORY: The Hackney Synagogue was built in 1897 to designs by Delissa Joseph. The community was originally located on a neighbouring street, Darnley Road, before moving in 1885 to the vacated premises of Dalston Synagogue further north. In 1892, the synagogue returned to south Hackney, acquiring a site on what was Devonshire Road, renamed Brenthouse Road in 1938. Here they constructed a temporary place of worship. The congregation became a constituent of the United Synagogue in 1897 and with affiliation came funds to rebuild. This is the synagogue that stands today, extended in 1936 to designs by Cecil J Eprile which involved the demolition of two bays of the late C19 building, the expansion of the prayer hall by two bays and the construction of a new entrance lobby on the site of a neighbouring terraced house. In the second half of the C19 there was an influx of Eastern European and Russian Jewish refugees to Britain, most settling in the Whitechapel and Stepney areas of East London at first. Their religious practice contrasted with that of established Anglo-Jews who descended from the first post-settlement communities of the 1650s and whose integration into English society was advanced, some holding seats in Parliament. The latter worshipped at 'cathedral synagogues' built in a Romanesque or Moorish style in North or West London (the apogee being the New West End Synagogue in Bayswater); the former in makeshift prayer halls in the East End: at the back of factories or houses, such as that at 19 Princelet Street, Spitalfields, or in converted chapels such as that on the corner of Fournier Street and Brick Lane (now a mosque). The anglicised community sought to protect their newly-won rights and acceptance in society by encouraging recent immigrants to join the United Synagogue (founded in 1870) and to adopt the language and cultural practices of their new country. This effort is epitomised by the construction of the grand East London Synagogue in Stepney in 1876-7. An umbrella organisation for the more traditionalist immigrant communities, the Federation of Synagogues, was established in 1887. They also built synagogues in the East End, albeit in a much humbler manner: the Great Garden Street Synagogue is a good example. These contrasting developments in the story of Jewish communities in England are manifest in the history of the Hackney Synagogue. As some from the immigrant communities of Whitechapel prospered, they moved away from that area to lower-middle class Hackney or Stamford Hill. In 1895 Hackney Synagogue served a district 'thickly populated by the better class of Jewish working man', (from M Berstein's work on Jewish Stamford Hill published in 1976, quoted in the VCH volume referenced below). The settlement in areas like Dalston or Canonbury was described by Charles Booth in 1902 as 'among the first steps upwards of the Whitechapel Jew'. The affiliation of the Hackney community to the United Synagogue at this time indicates that the newcomers were moving away from traditionalist rites. With the affiliation came the funds to build a grander building than the old prayer halls of the East End. The movement away from Whitechapel and Stepney accelerated in the interwar period, was directed towards the newly-developed suburbs of North London such as Golders Green and Hendon. Communities in Hackney continued to expand too, as evidenced in the extension to the Hackney Synagogue in 1936. Delissa Joseph designed six other synagogues at Hammersmith, Hampstead (Grade II*), Finsbury Park (demolished), New Cross (destroyed in WWII), Queenston Road, Manchester (Grade II) and Cardiff (Grade II, but demolished behind façade). The plans for the latter and for Hackney Synagogue were displayed at the Royal Academy in 1897. He was also a designer of mansion flats, commercial blocks and an expert on the provision of superstructures over the booking halls of London tube stations. He was the nephew of NS Joseph, the first architect for the United Synagogue when it was founded in 1870 and the cousin of Nathan Joseph, the architect of Shell-Mex House on London's Embankment. Cecil J Eprile was also a prolific synagogue architect, his principal works being Cricklewood Synagogue of 1930-1 and Hendon Synagogue of 1934-5. * an important shul in the history of Jewish immigrants to England, evidencing how members of the community moved up the social scale from the slums of Whitechapel to respectable lower-middle class Hackney.